* have little discernment and will feed on and drink what is not good for them. Because of health issues and the usage of the wool, sheep desperately need to be sheared, which usually takes place twice a year. If sheep are not sheared to remove the accumulation of dirt, caked mud, and other contaminates that mat next to their skin, they will develop infections and health problems, possibly dying. During shearing, sheep can experience a lot of stress and need an experienced shearer. The sheep will fight it until they are on their backs, held in the arms of their shearer, then, they will give in and relax. It is done quickly so no harm comes to the animal. After being shorn, sheep need protection from the elements. If sheep are not shorn, it decreases their mobility, and, if not done before the heat of summer, they will be susceptible to heat stress. Also, if not sheared at the proper time, their vision will be impaired. Shearing keeps sheep productive and also allows for new growth. If a sheep falls down and ends up on its back, it cannot right itself without help. No matter how loud his bleatings for help may be, the other sheep cannot help it get right. If left by itself too long, it will eventually die, so the shepherd watches to make sure each one stays on its feet. Many larger animals like horses, camels, elephants, and some others were created to carry loads on their backs. However, when it comes to sheep, they are incapable of carrying any load on their backs. Sheep often need rest but don’t realize it. 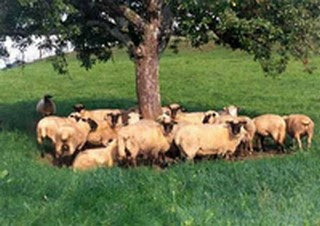 However, it is impossible for a sheep to lie down and rest if surrounded and pestered by insects or parasites. In order to rest, it must also be free from fear, hunger, and friction with others. * Do you need to be sheared of your circumstances? * Do you need to get rid of any dirty issues in your life that might be causing emotional, physical, or spiritual problems? * Do you have better spiritual eyesight after a shearing session? * Do you fight those times of being sheared by the Shepherd? Or do you relax in His arms and allow Him to work His will in your life? * Ever feel like the commercial, you’ve fallen down and can’t get up? And no one comes to help you? You can only be righted by the Shepherd. * Do you carry your burdens around in a backpack, a little red wagon, or a U-Haul? Or have you let them go and given them to the Lord…and not taken them back? * Are you free of those things that bother you, free of fear, hunger, and friction with others so that you can lie down in green pastures, resting your soul? Lovely article, about sheep and about us. Thanks. We certainly are very similar to sheep! I would probably be one who doesn’t like the sheering process and I tend to carry loads that I wasn’t meant to carry. It’s a good lesson. It sounds similar to the pruning process. I know in my garden I hate to cut back sometimes but then the new blooms can blossom. I so want to bloom where I’m planted! Hmm …maybe another blog post. I can say that I’ve learned much recently. I’m learning though to not resist this process and instead to grow and learn from it. And most of all …to depend on the Lord and trust Him. Thank you Lynn for your encouragement and support. I’ll email you soon with an update but we’ve had lots of activity on the house. The open house went very well but still no firm offers …yet. I’ve so enjoyed these posts, Lynn. That the Bible speaks often of God being our Shepherd isn’t a mere coincidence, I think. Despite all of our talents and ingenuity, despite all of our advances, we are still sheep and always will be. Beautiful post, Lynn. I think I’m like the sheep who fights . . . even though I know my Shepherd is good, and only wants what is best for me. This is so very true. It’s sad that we are so comparable to one of the dumbest animals on earth… lol. I must confess that I can be a lot like the sheep that struggles in the shearer’s arms. I don’t always make it easy for the Lord to expose the filth that collects in my heart. I’m not just a dumb little lamb… I’m a stubborn one too! Thanks for the lesson, Lynn! Another wonderful post, Lynn! I’m afraid I feel more and more “sheepish” with each of your posts! Thank you for the encouraging reminder of the Good Shepherd as the answer to each of these problems. nice… blog.. I enjoyed reading your posts….. keep it upp…. thanks….